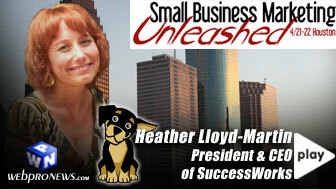 At Small Business Marketing Unleashed in Texas, Abby Prince and Heather Lloyd-Martin, the President and CEO of SuccessWorks, sat down and had a nice chat about content and keyphrases. Heather explains that a lot of people have the wrong idea about content and keyphrases. Catch her complete explanation, right here on WebProNews. WebProNews Reporter Abby Prince spoke with Kelsey Ruger of PopLabs, while at Small Business Marketing Unleashed in Texas. Everyone can always use link building tips and Debra Mastaler, the President of Alliance-Link gave us several. While in Texas at Small Business Marketing Unleashed, WebProNews Reporter Abby Prince and Sage Lewis, the Founder of SageRock.com. I have been asked to help launch a new community website. I have the time to launch, but not maintain. The operators of this site are nearly computer illiterate, but must be able to do their own updates. I feel that maybe a CMS may be the answer, but I have never worked with one. I know this is like asking, "What kind of car should I buy?" How many responses are there? Is CMS where we're headed here? And moreover, what CMS system, once set up would be the easiest (I can't stress that word too much) for them to deal with? I always appreciate your advice. StumbleUpon has been around a while, and if you're like 5 million others, you understand what an addictive, stimulus-response type network it really is. But like with other social networks such as Digg, Twitter, or Facebook, many marketers are still at a loss for how to make the most of it. Editor's Note: After a decade of SEO and more direct ways of online marketing, spreading the word indirectly via social media to build links, traffic, and conversions is still a hazy concept many are reluctant to accept. Are you convinced this could work or are you still holding out? Let us know either way in the comments section. There has to be value in it; eBay bought the thing for $75 million last year. One of the reasons was to extend its ad network—a good move considering StumbleUpon just hit 5 billion stumbles. There also is the quick and dirty* way to get exposure on the network, via the ad system. Maybe you've maxed out your ad budget already, though. Even if not, traditional ads don't build the brand relationships a solid, active presence can. In the case of social media sites like StumbleUpon, that relationship costs time, not money. If approached correctly, they can generate sustainable, meaningful traffic. Not Digg traffic, real traffic. While Digg traffic has been criticized for being more of a locust swarm swooping in to eat up your bandwidth and move on, fans of StumbleUpon have noticed not just a boost in better quality traffic, but some have reported a marked increase in conversions. One thing the StumbleUpon experts have in common, though: They're use of it is part of a long-term traffic-building strategy, not a hit-it-and-quit-it move. A WebmasterWorld member broached the subject recently, wondering about what kind of value a link in StumbleUpon really held. The query centered on whether a link from StumbleUpon could be compared to one in a reputable directory. The short answer is that it's apples and oranges. StumbleUpon links are nofollow, so it can't be gamed for link juice. A representative of MartiniBuster suggested the querent was "viewing the image from too close and see only green pixels." Utilization of StumbleUpon is a big-picture thing. Edward Lewis, who is SEO/SEM Project Director at SEOConsultants.com and goes by pageoneresults in the forum, agreed. "Stumbleupon has been in my top referrers for a couple of sites I have…. I wouldn't even think about the link value from an SEO standpoint…. Top Stumblers create a snowball effect that is kind of neat to watch. Once a Stumbler gets ya, then all their freinds start and it becomes viral. I know, I've been Stumbled quite a few times, some of them years ago and they show up all the time as referrers, every day as a matter of fact." It's not about the individual link on StumbleUpon, it's about the exposure and about the chance that someone sees your submission and blogs about it, and someone else blogs about it, and so on. Then you get not just brand recognition but nice blasts of link juice as well. The key then, in addition to submitted content worth passing along, is to become a top user at the network of choice, a position that takes time and participation to achieve. If you thought of it as a link-building strategy, though, and then thought of all the time you've already spent building links, this route may seem like a viable option. Tamar Weinberg, who says she's Dugg over 20,000 stories, says social media marketing requires a different mindset from SEO. "I submit stories because I am not only submitting stories: I am actively engaging in the community. I am commenting. I am studying what’s been successful and what hasn’t been. It’s a completely different mindset than I had when I started using these social networks — simply because I had not given the networks and the users within a chance." In other words, StumbleUpon or Digg are not places to dump pitches and glitter. They are places to build a brand. As a matter of fact, as soon as it's apparent to the communities a marketer is abusing their trust by always ptiching, the marketer will be tossed out. A blogger named Maki has put together a comprehensive guide to marketing on StumbleUpon. Maki warns not to expect loyal RSS subscribers or ad-clickers, but does cite other benefits like generating rapid exposure, establishing a reader base, gaining backlinks, diverse demographics, and long-term traffic. Dharmesh Shah posts 28 tips for becoming a StumbleUpon superstar, which are summarized in 4 steps by the smart alecks at Valleywag. What's the result of all that time engaging the community? Well, I can't testify to the efficacy of Invesp's "Breaking the Digg Code" program, but Khalid there claims to have increased his conversions by 400%. That's not an endorsement, but increasing conversions is sort of the idea behind social media marketing. *I'm not implying advertising is a dirty business. Even if it does pollute sometimes, it's essential to building business. I'm implying you can just throw money at it and forget it, if you wish. ...and they listened to user-feedback to upgrade them. Do you have a business site? Submit your business related site FREE!